There is an impacted fracture of the proximal pole of scaphoid with a few tiny fragments off the medial cortex of the proximal pole of scaphoid. 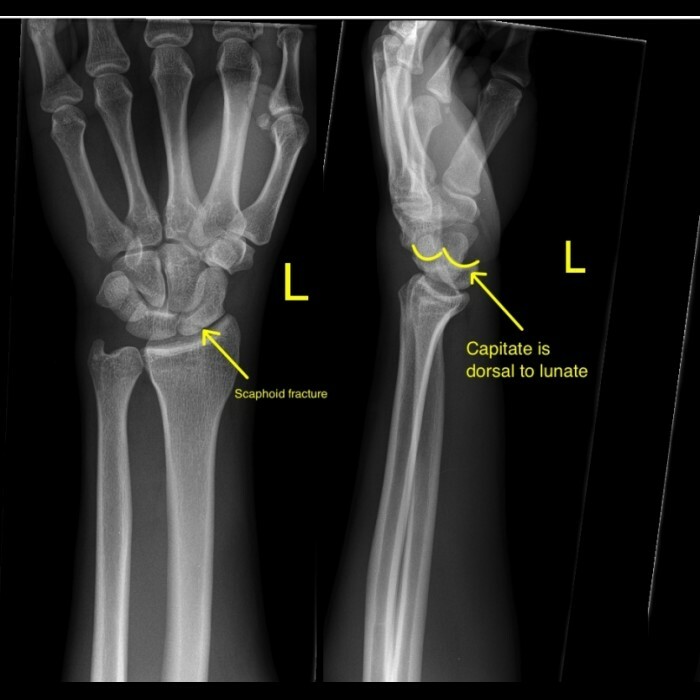 There is complete lunate dislocation with the lunate rotated and volarly displaced. The radiolunate alignment is completely disrupted. There is significant widening of the scapholunate and lunotriquetral interval. Also seen is a tiny cortical fragment coming off the distal radius dorsally. A backslab, and appropriate analgesia is required. Neurovascular examination to be performed and documented. D/w the orthopaedic registrar, and in general in the hospital setting there should always be another person on site who is able to review the films with you. Lunate dislocation is an orthopaedic emergency and the management is theatre for reduction. Unlikely to be a Biers block in ED. It is probably worth considering what the top ten missed fractures are, and spend some time on them. This is one of them. What might the top ten be? Also the following reference looks at: scaphoid fracture, elbow and calcaneus.